Made in Northern Ireland Baked on a hot plate for a soft and comforting eat Why Not Try Toast the potato cake then top with smoked salmon and a dollop of crème fraiche. Finish with a squeeze of lemon juice. INGREDIENTS: Water, Dried Potato (24%), Wheat Flour (Wheat Flour, Calcium Carbonate, Iron, Niacin, Thiamin), Rapeseed Oil, Salt, Preservatives (Calcium Propionate, Sorbic Acid), Palm Oil, Dried Skimmed Milk. May contain soya. For allergens, including cereals containing gluten, see ingredients in bold. Instructions: Time: 2-3 minutes, Temp: Medium Place under a pre-heated medium grill for 2-3 minutes. Turn occasionally. Instructions: Time: 2-3 minutes Fry in a little oil or butter for 2-3 minutes, turning occasionally. Drain well before serving. 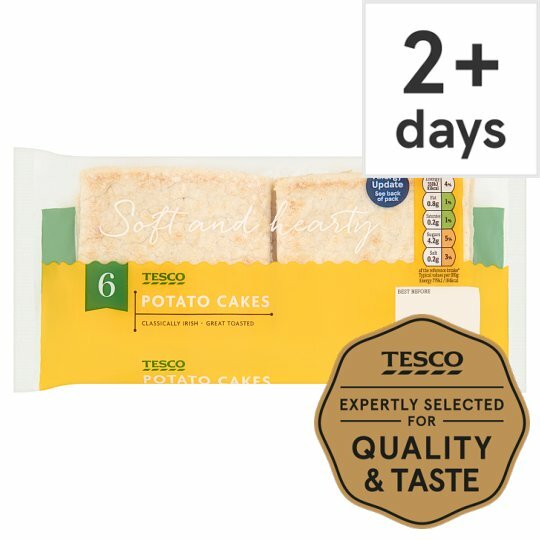 Once defrosted use within 2 days and do not refreeze.